One woman, a buncha guitars, and a whole lotta blue smoke. Using both acoustic and electric guitars, Gina De Simone serves up a spicy mix of finger-slapping funk, jazzy blues and smoky folk guitar. Her new CD “The Moons of Jupiter” is funky, energetic, soulful. Marked by Gina’s signature sound “acoustic groove” this CD is a journey through space, time and musical genres. You’ll travel from pure rock, to honky-tonk, to acoustic blues and more. Every twist and turn accented by stunning guitar work. Once the grooving rhythms have grabbed your attention you’ll find sincere, meaningful and often humorous lyrics. Born and raised in the Silver Spring area, she picked up the guitar at age 9 and began taking lessons at a local music store. “I wanted drums,” she explains, “but my parents gave me a guitar instead. 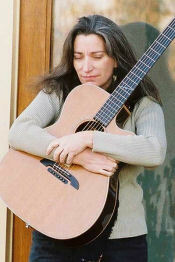 Turns out I love playing guitar, but I think my songs are so rhythmically oriented because there’s a bit of drummer in me.” As a teenager, Gina broke the stereotype of the female folk guitarist by playing lead guitar in rock bands. Today she backs up many of the area’s finest songwriters and bands. She began a lifetime of guitar teaching when the same local music store where she learned guitar called to ask if she was interested in teaching. In addition, to running a studio of dedicated students, she continues honing her skills by taking lessons from master guitarists like Al Petteway, Del Rey, Steve James and Mary Flower.